To say that 2009 was a challenging year would be a gross understatement. As the economy begins to emerge from the worst recession since the Great Depression, all signs point to a recovery in progress. It is likely that the economy emerged from recession during the summer months when the vicious cycle of spending reductions, layoffs, and shut-downs gave way to a virtuous cycle of increased spending, hiring, and production. Since then, it has followed a V-shaped growth trajectory; however, the weak consumer sector and continued high unemployment are likely to weigh down the recovery. Consumers are working to pay down debt and have become cautious in their spending. They have reduced their debt levels, but this deleveraging process is likely to be ongoing for the next several years, with one in five homeowners underwater (owing more on their mortgage balance than their home is worth). And as foreclosures continue to rise, inventories of so-called “distressed properties” will put downward pressure on home prices. Still, high housing inventories plus high levels of unemployment and credit constraints will keep new homebuilding at low levels in 2010. The collapse in home values and high unemployment have boosted the savings rate from 2.7 percent in 2008 to 4.6 percent in 2009. As a result, consumer spending, traditionally the backbone of the economy, fell for the first time since 1938 by 0.4 percent in 2009 and will remain anemic, growing by 2.0 percent in 2010 and 2.5 percent in 2011. And a cultural shift towards thrift seems to be emerging, though the United States will remain the world’s largest consumer. As economic conditions and confidence improve, business investment will recover, growing 2.5 percent in 2010 before accelerating 7.5 percent in 2011. The federal stimulus package and growth in U.S. exports mitigated the downturn and have helped stimulate the recovery. The emerging economies, in particular Brazil, China, and India, resumed strong growth quickly after the financial crisis. These economies resumed purchases of U.S. goods, providing some support for the beleaguered manufacturing sector. The American Recovery and Reinvestment Act, the massive stimulus package enacted in 2009, was designed to inject $787 billion into the U.S. economy through a combination of tax benefits, entitlement spending, and direct spending. By the end of 2009, about one-third of that amount had been spent. The bulk of the remaining stimulus is expected to be spent in 2010, with smaller amounts in 2011 and beyond. The administration claims nearly 600,000 jobs have been created or saved as a direct result of the stimulus package. In addition to creating jobs, many components of the stimulus package were designed to improve energy efficiency. The stimulus package provided $32.7 billion in energy-related grants. Of this, $8 billion is destined for weatherization assistance and grants to states to improve energy efficiency. This has obvious positive implications for the insulation industry. 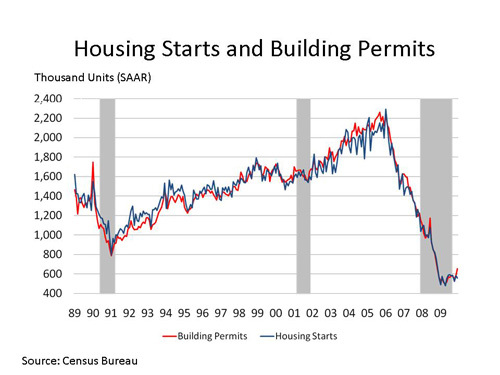 The downturn in residential construction appears to have reached a bottom, though housing starts remain at a fraction of their 2006 peak. It is hard for homebuilders to compete with the fire-sale prices of many existing homes on the market. Housing starts are expected to reach 750,000 in 2010 before recovering further to 1.15 million in 2011. In a reversal of the trend of the past several years, the outlook for nonresidential construction is weaker than that of the residential sector. In the industrial sector, construction is tied to capacity utilization rates still recovering from historic lows. Commercial construction follows residential construction, which has fallen sharply. Public construction spending has been buoyed by federal stimulus; however, many public spending projects rely on state and local tax revenue, which has fallen sharply due to the recession. Nonresidential construction spending is expected to fall 15.0 percent in 2010 following an 11.0 percent decline in 2009. In 2009, as the financial meltdown cascaded, panicked businesses and consumers held back spending starting in the fourth quarter of 2008. As demand fell sharply and synchronously, inventories surged throughout the supply chain. Thus, throughout the first half of 2009, a massive $160 billion inventory liquidation took place and production fell. Industrial production reached a bottom in June 2009 and has been improving since. 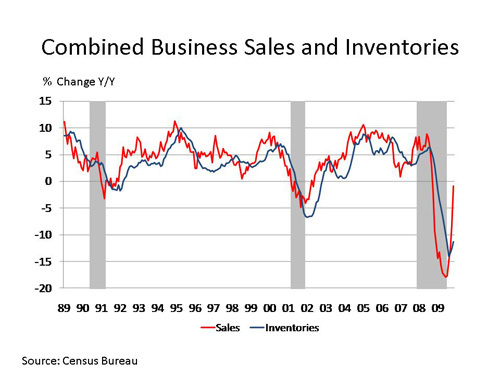 The inventory destocking has slowed, and moving into 2010, firms are now running on extremely lean inventories. As firms rebuild inventories across the supply chain, manufacturing production, which first turned around in the summer, continues to advance strongly. Leading indicators of manufacturing activity are pointing to further improvements in demand. Although projected growth rates for most industries appear positive in 2010, they must be seen in the context of the exceptionally sharp declines seen in 2008 and continuing into 2009. Moreover, it may take years for activity to recover from these steep declines and reach past peaks. For the business of chemistry in the United States, the steep and sudden drop in spending caused massive inventory imbalances going into 2009. Demand for many chemistry-intensive goods (light vehicles, construction goods, appliances, furniture, carpeting, etc.) plunged. Much of 2009 has been spent working these inventories down. As a result, chemical production was weak. Chemical industry output (excluding pharmaceuticals) will grow at a 3.0 percent pace in 2010, strengthening basic chemicals, and specialties will strengthen to 3.3 percent in 2011 as the industrial recovery deepens. During the recession, even the food processing industry posted declines. Food output fell by 0.4 percent in 2009, while the beverage segment fell 2.5 percent. Many strapped consumers worked to cut their food bills by shifting consumption to lower quality foods, buying in bulk, and purchasing fewer convenience foods. As the employment situation (and subsequently incomes) improves, food processing will continue to grow slowly. The pulp and paper industry was already in trouble before the recession hit. The rise in electronic media and paperless transactions have curbed demand for many paper grades. Paperboard, on the other hand, is tied to packaging and shipping. As manufacturing has moved abroad, so has some paperboard demand. Counteracting that trend somewhat is the rise in paperboard for shipping containers used to deliver consumer goods ordered through the internet. Both segments were hit hard by the recession, which caused paper production to tumble 13.2 percent and paperboard to fall by 8.3 percent. Paper and paperboard production is expected to continue to soften in 2010 by another 2.5 percent before resuming growth in 2011 as the underlying downward trends offset gains in demand as the economy recovers. At the height of the commodities boom in 2008, crude oil peaked over $140 per barrel and gasoline rose above $4.00 per gallon. As a result, consumption fell sharply. Following the financial meltdown and subsequent sharp contraction in economic output, petroleum demand declined further. In 2009, refinery output of finished gasoline fell 16.2 percent to 1.3 billion barrels. Refinery operating capacity utilization fell from 84.9 percent in 2008 to 83.4 percent in 2009, the lowest level in more than 20 years. Going into 2010, inventories of refinery products remain high and demand remains weak as the recovery slowly gains traction. Despite the recession, which curbed industrial demand for natural gas, production of the vital fuel rose as new shale deposits were developed. According to the U.S. Energy Information Administration (EIA), marketed production of natural gas grew 3.6 percent to 60.2 billion cubic feet (BCF) per day in 2009. When gas prices were relatively high during 2007–2008, investment in gas drilling boomed. Production is expected to ease back to 58.4 BCF per day in 2010 as investment weakened during the recession. Over the past few years, natural gas production has increased substantially following the development of domestic shale gas resources. These new shale gas deposits have huge potential and have generated a lot of interest, especially as the nation considers sweeping energy and climate change legislation. Natural gas emits about half the carbon dioxide of coal, making it an attractive option to reduce greenhouse gas emissions. Advances in drilling technology have expanded gas production, but concerns have been raised about potential ground water contamination from hydraulic fracturing. Continued development of shale gas will require new investments in gas processing facilities and pipeline infrastructure. The short-term outlook for shipbuilding is poor. Following a historic downturn in trade following the financial crisis in September 2008 and the steep global recession that followed, global trade volumes dropped more than 60 percent year-to-year at their lowest point in January 2009. As the emerging economies quickly recovered, trade volumes bounced back during the second half of 2009. The International Monetary Fund expects trade volumes to rebound by 5.8 percent in 2010 and 6.3 percent in 2011. But order books remain lean, at least in the United States. In China, however, shipbuilding is expected to expand, as the Chinese government has provided preferred interest rates and other stimulus measures to boost Chinese shipbuilding. The U.S. economy has taken a hard hit over the past 2 years but is on the mend. The strong rebound seen thus far has been largely the result of the stimulus package, exports, and the end of the inventory restocking and the subsequent rebuilding of business inventories as demand strengthens across the supply chain. The headwinds of persistent unemployment and continued turmoil in the housing market remain, however. Resolution of the housing crisis and the credit crisis must precede any broad-based recovery. Barring any unforeseen jolts to the economy, we anticipate GDP to grow by 2.7 percent in 2010 before strengthening further to 2.9 percent in 2011. Forecasting at this stage of the business cycle involves considerable uncertainty. Most indicators point to continued recovery. Following the inevitable inventory rebuild, however, the durability of the recovery is in question. While we do not anticipate a double-dip recession, the continued weakness in the housing and consumer sectors make a strong recovery along the lines of the emerging economies unlikely in the United States. Recovery from recessions following financial crises tend to be long and protracted, and this time appears to be no different. There are several risks to the outlook, any one of which could derail the fragile recovery. These include terrorism, sovereign debt defaults (especially in eastern and central Europe), an extension of the credit crisis to regional banks from defaults in commercial real estate, and fiscal imbalances and an increasing likelihood of a dollar crisis.